On a bright March day at the Liberty Baseball Stadium, Flames second baseman Ryan Seiz was momentarily distracted from the game at hand by the sound of someone screaming in the stands. The best part of all? Ryan Seiz gets to return the favor. 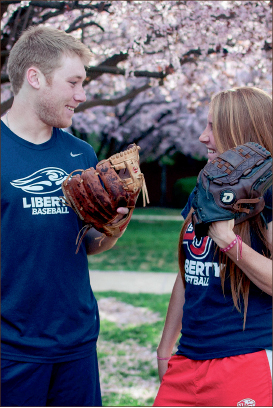 Holly Seiz plays infield for the Flames softball team, and the two self-declared best friends cite each other’s support as one of their favorite parts of playing their sports. Growing up, Ryan Seiz was the first of the two on the diamond. Only at their father’s urging did Holly Seiz finally make her athletic debut. “It was T-ball, first,” she admitted, cringing slightly. Ryan Seiz’s eyes widened, as did his grin. It was the start of the siblings’ shared passion for their sport. They also played the same position, third base, for the same high school, where Ryan Seiz could watch Holly Seiz’s games from the baseball diamond. It was a unique experience, one the two did not expect to share again once Ryan Seiz graduated. 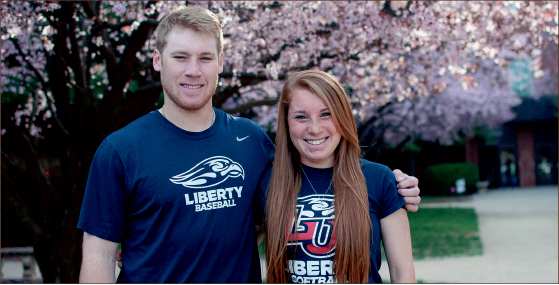 It was the same year that Holly Seiz — who, on the other hand, had dreamed of attending and playing softball for Liberty since middle school — arrived in Lynchburg for her freshman year and walked on with the team. But a standing offer to play for Head Coach Jim Toman and continued encouragement from Holly Seiz, whom Ryan Seiz cited as a major spiritual influence in his life, slowly changed his mind. Soon, brother and sister were back in familiar, familial territory — playing nearly the same sport, for the same school and with the same name stitched on the back of red-and-blue jerseys. They joke that the similarities are even more apparent off the field. The two burst out laughing at the same time. Of all the things the siblings share, though, it is their mutual pride and love for each other that outshines the rest.